It’s autumn, not winter. This is directed at Mother Nature, so she can remedy the situation. A situation that is making it difficult to be chipper when I roll out of bed each morning and face the possibility of not showering in order to avoid getting naked and all goose-bumpy. It’s cold here in Melbourne, if you haven’t already guessed. I was under the impression that autumn looked like orange, red and brown cloaked trees, people in flowing layered fabric, gentle winds and tousled hair, with the romance of a natural change in the air. A casual stroll yesterday revealed that most trees in my neighbourhood hadn’t got the memo and shed all their leaves in a winter-like fashion. Soon after, the wind had whisked them away before I could even savour the picturesque leaf-carpets at the base of each tree. This left me rather disenchanted. ‘Okay, fine’, I thought. I’ll resort to edibles instead to celebrate the arrival of autumn. Janella Purcell’s ‘Eating for the Seasons’ is a resource of great value for anyone concerned with eating not only to take best advantage of natural produce at different times of the year, but also to educate oneself in the needs of our bodies and how this changes seasonally. For instance, did you know that in summer the object is to ‘let you energy flow out. You’ll want to expel from your body the last of the stored heat of winter. To aid this, induce sweat by eating spicy food. It’s time to get outside and enjoy the sun, sea and other people.’ Cheers Janella. So, it’s autumn in Australia and apparently it’s time to nurture and support our organs and build blood in preparation for winter. The lungs and colon deserve special attention, as they are ‘eliminatory channels’, and will assist in the ‘letting go’ process, apparently a necessity both physically and mentally in autumn. Cool, huh?! So what then is on the menu for me? Boiling and steaming are most appropriate this season as the point is to slow down the cooking process and work towards casseroles and soups as winter rolls around. Avoid heating spices like chilli and paprika, as these cause immunity to be lost through your skin, and staying healthy is most fun! For breakfast this morning I had a slice of spelt loaf, toasted with tahini and honey (tahini is a good source of protein, fibre, good fats, minerals, vitamins, antioxidants and carbohydrates – it’s a superfood!). I accompanied this with a ginger tea I made from grated ginger, juice of 1 lemon (also in season) and hot water. And if you can’t understand my handwriting! 1. Lightly fry chopped chunks of 8 long eggplants in 2 tbsps of oil (grapeseed or macadamia oil) till they start to brown, then remove and place on a paper towel to absorb excess oil. 2. Fry the chopped ‘half moons’ of 1 leek in a pan with another 2 tblsps of oil then add 2 crushed garlic cloves, 1 tblsp of finely sliced ginger and 1 tblsp of finely chopped coriander stems. 3. Add the eggplant back into the pan along with enough water to cover. 4. Then add 3-4 sachets of Dashi (japanese soup stock – I used Shimaya, a vegan variety) along with 1 tsp of sesame oil and 2 tsps of tamari. 5. Let simmer for about 15 mins then gently add large chunks of two packets of silken tofu. 6. Serve garnished with spring onion and coriander leaves and with quinoa or brown rice. This entry was posted in Melbourne, Taste and tagged autumn, eggplant, food, gemma, recipes, seasonal, taste, tofu, vegan. I agree with Lauren. If you make a cookbook with illustrations like that for every single recipe, I’d totally get one! 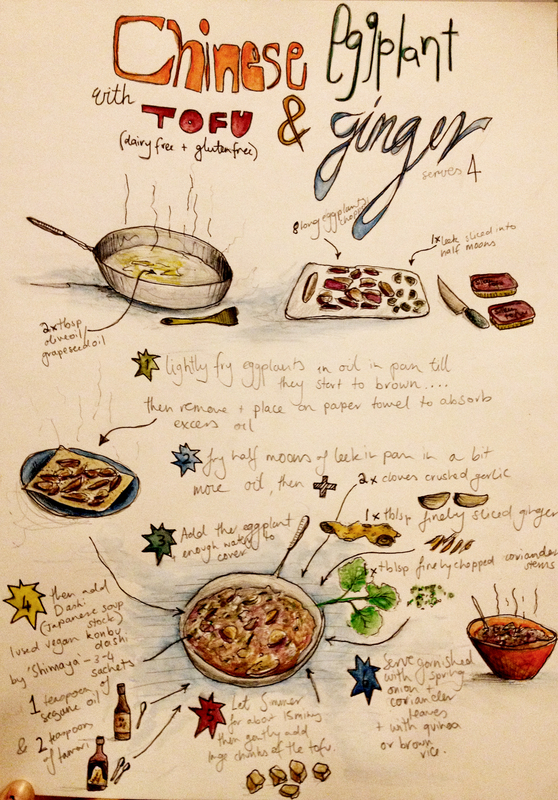 Thanks Gals – I much prefer a well illustrated recipe than a long list of instructions – also, I love simplifying a recipe and trying to understand the entire process before I begin….that way it seems to last in my brainspace! Natalia – I would love to do one for summer for you cool northern folks…. What a gorgeous post. I love your drawing! Eating seasonally is so important but people don’t seem to do it as much anymore.